NYC Public School Parents: Please join us Tuesday & speak out against new law requiring NYC give charter schools preference for space! Please join us Tuesday & speak out against new law requiring NYC give charter schools preference for space! Please distribute to all parents! 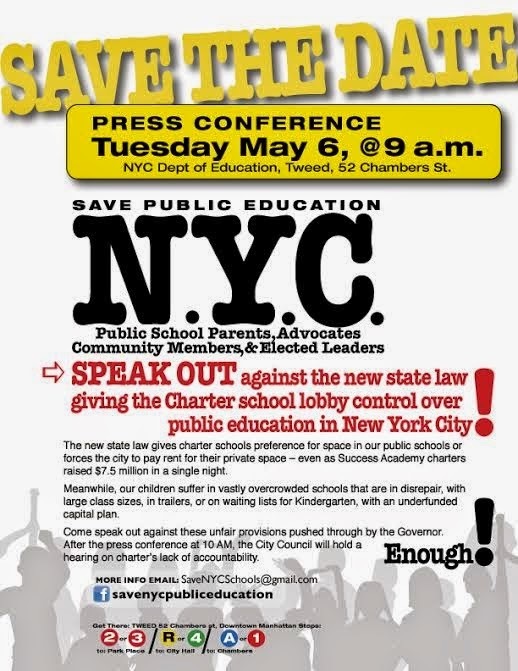 Parents and elected officials are holding a press conference Tuesday May 6 at Tweed to speak out against the new state law that gives any new and/or expanding charter free space either in our public school buildings or in private space paid for by the city . Meanwhile, many thousands of NYC public school students are sitting in vastly overcrowded schools, subjected to excessive class sizes, in trailers or on waiting lists for their zoned schools, with an underfunded capital plan. This is one of the worst charter giveaways ever passed into law, and will create even more inequitable conditions in our city going forward. Meanwhile, Eva Moskowitz charter chain, Success Academy, raised more than $7.5 million in one night, from Jeb Bush and her Wall St. buddies, while claiming she could not afford to rent her own space. Instead, the DOE is being forced to rent three parochial schools for her, and pay for renovations to suit her specifications. Here is yet another shameless ruse in which Success Academy is planning to make big sums off the stock trades of their billionaire supporters. Clearly the charter lobby wants to drain as much resources and space from the public schools in order to destabilize and further overcrowd the system, or else they would pay for space themselves. A flyer for our press conference is posted here: http://tinyurl.com/qy3mlaf Please invite your City Council members and other elected officials to attend as well. Hearings follow the press conference at 10 AM at City Hall on the lack of charter accountability, including their egregious practice of suspending and pushing out large numbers of high need students.